This isn’t a hotel but a restaurant on the side of a Swiss mountain – and it’s only open between May and November. But that gives you plenty of time to get in shape in order to actually reach the restaurant because it’s a three-hour hike from the valley below. 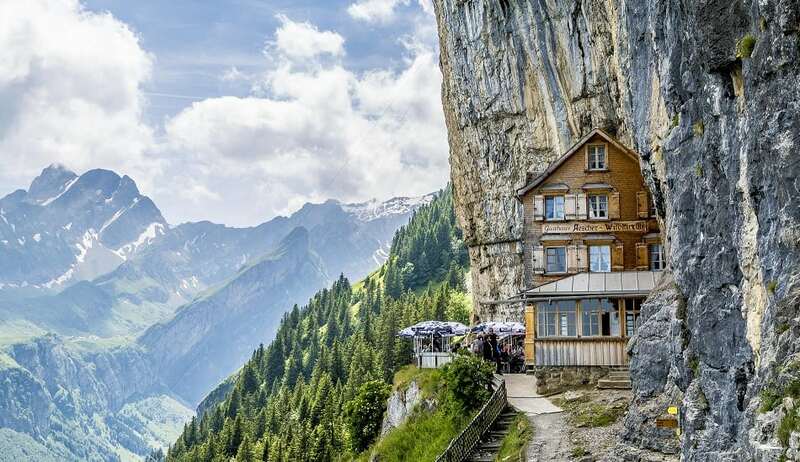 The Äscher Cliff restaurant which is approximately 3 miles above sea level is lodged on the side of a mountain in the Alpstein area. No kidding. It literally clings to the side of a vertical cliff about 323 feet high. Once you reach this fantastic restaurant you have spectacular views of the whole area including the picturesque Seealp lake and the awesome Säntis mountain. Don’t worry about hiking down on a full stomach. A cable car will take you back down to the valley.